I want to be popular but I don’t want to be in a clique. What should I do? Posted 19 June 2012 under Ask Us. It may feel good to be approached by someone who is in a clique. You’re not alone-most people want to feel accepted and popular, especially at school or in new social situations, but don’t fall for what appears to be a quick way to go from being unnoticed to being cool and popular! Your classmates will realize that you’re special and unique, and will like you for being real. Think about your values and what you believe in. Look for friends you can relate to based on similar interests. NEVER feel pressured to be like someone else or act a certain way to get the approval of others. The excitement of feeling liked by members of a clique will wear off quickly if you find out that they want you to do things or act in a certain way that’s just not you. Respect yourself – It may sound corny, but we all need to “like ourselves” and feel comfortable in our own skin. Most people don’t like feeling pressured to behave in a certain way. Give yourself a chance to meet different kinds of people – Having diverse friendships and interests makes life much more interesting. By joining a clique, you might limit yourself to the beliefs of one group. Learning about different people, their cultures, ethnicity, values, and beliefs is also a way of figuring out what you value. You shouldn’t be limited by just one group of people, as is often the case with cliques. Have your own opinion – It’s fine to agree with others and share the same opinions, but if you feel strongly about something hold your ground even if it goes against the beliefs of the group. Also, if friends have different opinions about something such as the type of music they like or something else they think is cool, respect their opinion too. 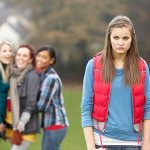 Don’t be afraid to speak up – You may find out that your group of friends has changed into a “clique”. Don’t be afraid to speak up if you notice that your friends are mean to girls outside of your group or if they exclude them from social events. If this happens, you may decide to make new friends or just limit your time with the group.